Simulated fluid flow in a small sub-volume. Red and blue arrows indicate fast and slow flow velocities while yellow and green arrows represent intermediate velocities. An interdisciplinary research team, coordinated by Dr. Keijo Mattila from the University of Jyväskylä (JYU), Finland, has set a new world record in the field of fluid flow simulations in the pore scale (through porous materials). 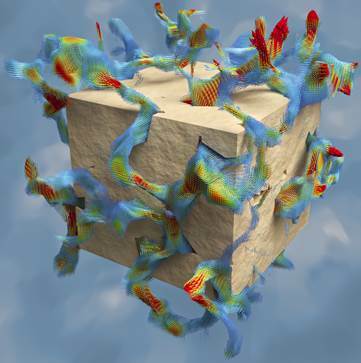 Using the world's largest 3D images of a porous material, that is, synthetic X-ray tomography images of the microstructure of Fontainebleau sandstone, the team succeeded in simulating fluid flow through a sample of the size of 1.5 cubic centimetres with a submicron resolution. This is an unprecedented resolution for the given sample size and corresponds to 16,3843 image voxels (voxel is the 3D analogue of pixel). To grasp the proportions, imagine that a common dice is cut into over 16 thousand slices and then each slice is photographed with a resolution exceeding the best we have in cinemas today. Porous materials are abundant in nature and industry and have a broad influence on societies as their properties affect, for example, oil recovery, erosion and the propagation of pollutants. Permeability, an indicator of how easily a porous material allows fluids to pass through it, is an example of their transport properties. Often the internal structure of a porous material encompasses relevant features at multiple length scales. This hinders research on the relation between the structure and transport properties: typically laboratory experiments cannot distinguish contributions from individual scales, while computer simulations cannot capture multiple scales because of limited capabilities. The reported extreme simulation shows that direct fluid flow simulations in the pore scale are possible with system sizes far beyond what has been previously reported. This advancement is important for, among others, soil and petroleum rock research where the achieved system size allows capturing the material properties more accurately. "Current computing resources permit simulations of this caliber to be used as a high-end tool, not as part of common workflow. Nevertheless, such a tool may be instrumental for fundamental research when trying to understand the properties of heterogeneous porous materials," Dr. Mattila explains. "These extreme simulations are the culmination of more than a decade of continuous research on the topic. In fact, from my perspective, the research began already around the mid-1990s in the Soft Condensed Matter and Statistical Physics research group led by Professor Jussi Timonen. The latest boost for the research came with our participation in two EU projects: CRESTA focused on the challenge of exaflop computing in applications, while SimPhoNy considers multiscale materials modelling. Also the computing services provided by CSC – IT Center for Science Ltd, Finland, have been pivotal in the development of high-performance simulation software," Dr. Mattila says.